Page navigation widget for blogger is a popular widget and that most bloggers make use of because these players are only provided in the wordpress blogs hosted or blogs. Since this trick is made ​​available to bloggers, I am giving you this Page Navigation Widget with options on different styles for the sake of customization. The default navigation links (i.e Older Posts) are not that friendly to visitors if you are having a lot of jobs and bloggers readers. Now here is a completely new script and that work for numbered page navigation (i.e. Panigation) for Blogger. 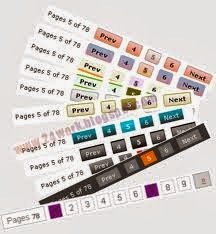 The paging widget for blogger is easy for the visitor to access. It is a must have for any new blogs. This new script allows you to add numbered page navigation to blogger/ blogspot blog with page numbers starting from (1, 2, 3, 4 ….) like those of a book. With this arrangement, you can say that there is organization in your post and reading is not a burden to those who visited your blog. Make sure that this is arranged correctly in your blog so that the sequence of posts and the like will be organized that will bring pleasure to readers. Optional: I suggest to keep it in default it is already customized for best. Thank you for this widget. My blog is in spanish and i would like to change "Page 1 of 6" and write "Pagina 1 a 6". How can i do it? Thank you. Yes I can modify it for you, which one of the listed above you want to used? That js is customized, I change the "Page" to "Pahina"
PS: If you still have problem, just post your comment below. I try it and it's ok for "pagina" but there is always "of" and not "a". Sorry for the problem in integration, the js cannot read the "á" maybe its ok for you to use "a", rather than this unreadable character. Yes it's ok and it's function! with "pagina" it's perfect! Thank you a lot! You are the lonely one you contest and that him code funcion for my blog! I'm going to read your other articles because i want to add buttons "like" of facebook to my articles. Thank you an other time. Your welcome, Yes read all other widgets I have posted here, you will love them. See you around. Just post comment to specific articles if your have problem or you need further assistance. Happy blogging!